It would have been a surprise if accusations of violation of Code of Conduct for public office holders leveled against Nigerian Chief Justice did not generate controversy. The high profile of the accused made that inevitable. Another non-surprise was that, for the second time within a week, there was misguided professional solidarity around the Chief Justice by almost all of them in the law profession. Earlier, journalists and non-journalists in the media profession virtually disregarded the indiscretion, which triggered military occupation of the premises of Trust group of newspapers in Abuja, Lagos and Kaduna. Hence, we cannot brush aside essential questions arising from the disturbing actions of state governors and lawyers who instigated Chief Justice Walter Onnoghen to boycott his arraignment at the Code of Conduct Tribunal and he did. Ironically, a day later, an Abuja High Court threatened to order the arrest of a former Accountant-General of the Federation, Jonah Otunla, for failing to appear for trial. Among the questions thrown up by the controversy on the aborted arraignment of the Chief Justice are (a) Was there a violation of the Code of Conduct for public officials? (b) if so, was official procedure complied with in arraigning the accused? (c) is there an appropriate time for invoking sanction(s)? (d) how tenable is it for a Chief Justice to resort to self-help even in challenging procedural defect in invoking sanctions? There is no doubt that, in summarily arraigning the Chief Justice, necessary procedure might not have been (fully?) complied with. What is arguable is whether that oversight would justify the self-help inherent in the instigation of those (especially state governors) who advised the Chief Justice to boycott his trial. Nothing could be more contemptuous. Who do these governors think they are? And the lawyers? Untouchables? Even in the much vaunted preliminary investigation by the National Judicial Council (NJC) of which the accused Chief Justice is the chairman, could he have judged himself liable? A judge trying himself for alleged violation of the law? Such descent portends anarchy. Chief Justice Onnoghen should have appeared at the tribunal, should have refused to enter a plea while his (battalion of) lawyers would then cite the defected procure adopted in arraigning him. If the tribunal upheld his plea, the matter would be dismissed pending full compliance with the procedure and if the tribunal rejected his lawyers’ submission, the Chief Justice would appeal as Senate President Bukola Saraki did last time. That is respect for rule of law. And Nigerian lawyers should know that the alleged non-compliance with procedure is neither peculiar to Nigeria nor the Chief Justice. Only three weeks ago, Scotland’s former First Minister, Alex Salmond was discharged and acquitted by a Court of Law on the ground of the failure of prosecution to comply with the procedure. Mr. Salmond was arraigned by his successor (Nicola Sturgeon) on charges of sexual harassment of some of his female staff during his tenure. The point of note is that Scotland’s ex-First Minister (equivalent of Prime Minister) neither boycotted his trial nor was he instigated by his lawyers to boycott. He established rule of law by turning up to face his trial. Reacting, Scotland’s First Minister apologised to the female complainants while promising to comply with the procedure and re-arraign her predecessor. By the way, President Muhammadu Buhari was left uncomplimentary by unconfirmed media reports that he did not know about the arraignment of Chief Justice Onnoghen. To the extent that Buhari did not instigate the trial, that is tenable and there ends his innocence. But any idea that Buhari was not informed before Chief Justice Onnoghen was summoned for trial only exposes the Nigerian leader to ridicule that he is not in charge. Chief Justice of Nigeria? Impossible. Nigeria might as well be involved in international war without informing President Buhari. On the other hand, should it be true that nobody informed Buhari before summoning the Chief Justice for trial. It is now an alarming feature that when public figures are accused of violating criminal laws, government is blackmailed with claims of persecution complex. The suspect is claimed either as their “son “ or “daughter” or the proceeds of theft or corruption sourced to either gift or estacode. That was the case when security operatives exposed serving judges all over the country last time. Only this stinking desperation could explain the group ethnic jingoism of some state governors, who said a summons by the prosecution should be bluffed. What was the big deal in summoning a judge for trial, even if criminal prosecution? Was Justice Ademola not prosecuted last time? Why did South-West zone governors not gang up publicly against his prosecution? Where were Nigerian lawyers then? Worse still was the case of Justice Ayo Salami, president of Court of Appeal, who was trying General Muhammadu Buhari’s election petition against President Goodluck Jonathan’s election victory in 2011. In pursuit of justice, Ayo Salami summoned INEC to produce copies of some election results at the next hearing. To pre-empt that development and while the trial was still on-going, Justice Salami was removed from trying that election petition and promoted to total irrelevance at the Supreme Court. Was Justice Salami the only qualified judge to be elevated at that time to the Supreme Court? The man politely turned down the unsolicited promotion and was suspended. He challenged his suspension. 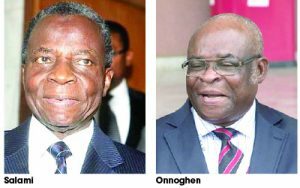 The entire judiciary, in complicity with the executive, frustrated Justice Salami and his suit, which was never tried conclusively until he (Salami) attained the retirement age of 70. Where were Nigerian lawyers throughout that ugly episode? Did state governors from North Central (Justice Salami presumably is from Kwara), in ugly display of ethnic jingoism, gang up in his favour? Lest we forget. Governor Obaseki of Edo State was nationalistic enough not to join the ethnic desperados parading as state governors in inciting disobedience of a tribunal’s summons. It is also absurd on the part of South-South governors drumming echoes of victimisation of a judge who, as head of NJC, recommended the trials, dismissals and retirement of other judges, surely, rightly in view of the high level of corruption ravaging the judiciary since several decades. On the face of it, there seems to be a point as raised by Senate President Bukola Saraki when he faulted the speed (actually he called it haste) with which all matters of the Justice Onnoghen arraignment were handled within days to summon him for trial. That is what justice is about. In the past, the petition against the Chief Justice would have taken years to investigate, if ever the suspect would ever be touched. We are more observers but are ever alert when lawyer combatants complain against or counter justify delay in justice, especially in criminal matters. In the past few years, lawyers and judges have been flaunting before and intimidating us with what they call Criminal Justice Act as evidence that no matter how minimally, the wheel of quick justice is now rolling in Nigeria. Of what use is that criminal justice act if such accusation of violation of Code of Conduct, even by the Chief Justice, could not be established within days? What is more, in this case, if media reports of the response of the Chief Justice to the allegations levelled against him are anything to go by, the man did not deny or challenge the financial assets credited to him by the Code of Conduct Bureau. The explanation in the media, so far undenied, was that he either forget or did not know. In short, right of fair hearing was extended to him. In fact, the Chief Justice never complained about any haste. Hence, he willingly responded to all inquiries within hours or days at the longest. Incidentally, we must resist reducing public institutions, even if inadvertently, to mere public decorations. Otherwise, why the convenient moaning about timing of the arraignment of the justice? When is the appropriate time for faulting a judicial officer for violating Code of Conduct? Before appointing or confirming him? Last time, when he was acting and probably was being investigated by the eventual petitioners, there was wild agitation all over the place, again, by ethnic jingoists, that the man should be confirmed immediately as he (Justice Onnoghen) was kept acting merely because he is from South-South. After allegations of violating Code of Conduct and the man was summoned for trial, the allegation of the ethnic jingoists and political opportunists is that timing Onnoghen’s ordeal on the eve of the elections is aimed at rigging the elections. If Code of Conduct Bureau summoned Justice Onnoghen for trial after the elections, there would still be ethnic agitation and political opportunism that his arraignment was aimed at stopping him from trying any potential election petition. When, therefore, is the appropriate time to arraign such suspect? Justice Onnoghen remains an accused until he is pronounced guilty and he has the right under the Constitution to pursue his case to Supreme Court, the highest in the land. What is unacceptable is the silly idea that he must shun the trial. Only the Code of Conduct Eribunal or another court can set him free. Equally unacceptable is the blackmail that Justice Onnoghen is being tried because of who he is. Oh yes, Bola Tinubu was tried by the same tribunal because of who is. Senate President Saraki was tried because of who he is. But they faced their trial and were acquitted, one of them by the Supreme Court. But if Code of Conduct Tribunal cannot try such fellows, or anybody for that matter, why not scrap it? All told, President Buhari must firm up in his fight against corruption. Otherwise, his effort will be frustrated by those he saddled with the task of enforcing laws against corruption, but who deliberately or ignorantly either misprosecute or under-prosecute their criminal catches to ensure discharge and acquittal by default. Are we to understand that prosecutors at EFCC are ignorant of the strict regulation that accused judges must initially be reported to National Judicial Council, which would probe them and recommend prosecution dismissal or retirement? If that were so, should the acquittal of Justice Ofili Ajumogobia at her first trial on the above ground not have put EFCC and other prosecuting institutions like Code of Conduct on the alert to, henceforth, follow that procedure? Buhari should watch out as he will continue to be embarrassed with poor prosecution. There was this other blackmail that Justice Onnoghen had been sacked or asked to resign. Such could not have been fair as argued in this column in the case of Senate President Saraki or when the senators were plotting to demand the removal of Justice Umar Danladi of Code of Conduct Tribunal while he was still trying Saraki. If necessary, especially depending on the ruling of Abuja High Court trying the validity of the trial of Justice Onnoghen, the Code of Conduct Tribunal, like the prosecution in Scotland, must return to the starting point by submitting to National Judicial Council whatever allegations against Justice Onnoghen. The matter can’t be swept under the carpet. •Next week: Coup in Africa? So what? I never like to miss Duro’s columns. A patriot to the core. Please keep up. You are absolutely right again but… that’s the Nigerian psyche. We always look for excuses for the ‘right guys’ thus making a mockery of the much touted “equality before the law” statement. When the Senate president was arraigned there were similar charades until he eventually got hos way and the entire process was abandoned. When can we seriously hold the ruling elites – it isn’t just from a ruling party or oligarch- accountable for their indiscretions and obvious contempt for the due-process? Anyway that perhaps s the tail-end of the National turn-by-turn chop-i-chop culture that has blind sided the facts and truth in our national psyche.